It’s a bright sparkly new year – and already I have to start with an apology! I know I said I would try to put some little ‘gifts’ up on the blog over the twelve days (and here we are on day twelve without so much as a Christmas doughnut!). I do have an excuse. I was laid up with one of the many Christmas lurgi bugs that are doing the rounds at the moment – so I wasn’t full of Christmas cheer; more like Christmas congestion! Anywho, I’m back for a year of vintage Puffinalia that sees the first new Puffin Post on the doormats of new young puffineers, eagerly ripping those membership boxes open to savour the contents (including their own fuzzy puffin). Things may seem bleak out there at the moment, but it is warming to remember that the powercuts and financial worries that accompanied the winter of discontent all those years ago also had it’s Puffin Club to give an identity to the avid readers of the 70’s. Maybe not a lot has changed after all! 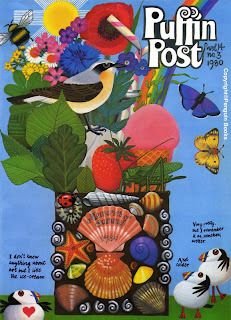 To make up for not posting the promised goodies over the festive season, please accept this offering: This is the cover to Puffin Post Volume 14 No 3 – Voted the best Jill McDonald cover by Puffineers following her death. It is very lovely! The second place by only two votes was Volume 8 No 2 – which I have already posted, followed by Volume 3 No 2 (which will follow, I promise, I promise, I promise). For those that may be interested, Jill painted 219 puffins on the covers of Puffin Post in total (though I hesitate to collate the total for the contents as well (should one include reprints?! ).